Lock Boxes are special post office boxes that companies have customers send their payments to. The bank then goes and deposits the checks directly into the companies account. This is done to speed up the system and efficiently deal with large quantities of checks. Problems can occur though as the bank employees are not often monitored and there is a large temptation to commit fraud. As they have access to the original checks, counterfeiting is not difficult and regular monitoring of the employees is key to insure integrity. 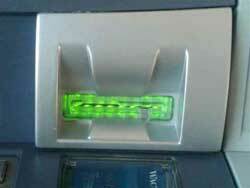 Mini cameras at ATM’s are used to get a hold of pin numbers for bank accounts. The mini cameras record the client entering their pin and this is sent to a nearby computer or laptop. The camera is used in conjunction with ATM skimming devices. These are devices that are portable card readers. They can read the card information and can clone your card, sell your information or cash out the cards account. This is a very serious form of fraud as many people use ATM’s and it is difficult to track down who stole your money and information. It is recommended that you always cover your hand so no camera can see what your pin number is. Blue Boxes are another form of fraud, though they involve telephones and getting away without paying for long distant calls. Blue Box users typically will call a toll free number and then the box will create a high pitch sound that mimics the sound of the dial tone when someone hangs up. From there the person can use the box to place a call to a long distance number without the phone company charging as their system does recognize that a call went through. The Blue box is a highly sophisticated form of technology, with 12 to 13 buttons the mimic the sounds of long distance dial tones. Blue Boxes are a form of fraud and it is important to realize that all forms of fraudulent devices are illegal and have serious consequences. Other types of fraud include credit card fraud and mortgage fraud. Have you been accused or charged with a Fraud Crime? Each case of fraud and fraudulent devices is often treated differently depended on the type of fraud, amount defrauded the intention to commit fraud, which appears to the court to be obvious in the case of fraudulent devices. This may result in various penalties, but without a lawyer, a person charged with this can expect a sizable sentence, fines and mandatory community service work, or possibly restitution. In addition, a criminal record may limit your ability to travel and find employment, as well as social ostracization. Our legal team of Bruce Karten & Stephen Hebscher have defended many individuals charged with fraudulent devices crimes. Our primary intention is to help you stay out of jail, and in some circumstances, to avoid receiving a criminal record in Canada. Our 60+ years of combined criminal lawyer experience, will offer you the confidence of receiving the best possible outcome in your Toronto fraudulent devices case. See what our other clients are saying about us. We can help you too!